India's Doctors Returning Home No other country has exported as many physicians as India. 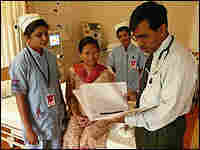 But the needs of India's growing middle class are luring doctors back. They're trading their lucrative U.S. incomes for a chance to reunite with family and build India's medical system. Dr. Prabhakar Reddy is an emergency room doctor in Bangalore, an Indian boomtown known for its call centers and software factories. But he used to have a good life in Louisiana, with a nice income and a lot of Cajun food. "I loved my crawfish there," Reddy says. Reddy is part of an emerging trend — Indian doctors who are giving up medical practices in America, where the money is better and the medicine more sophisticated, to return home. It's the opposite of a decades-old pattern. Ask Reddy why he left a handsome income and all that crawfish to practice medicine in India, and he'll tell you about a case he treated here not long ago — a suicidal 17-year-old. "He walked into this emergency room with his father and said 'I failed in my exams so I didn't want to live anymore. So I took my father's blood-pressure medication.'" The boy showed Reddy a fistful of empty pill packs. Reddy immediately sent him upstairs to Wockhardt Hospital's intensive care unit. This well-equipped new hospital is part of a for-profit chain, a phenomenon spreading throughout India. Dr. Rajanna Sreedhara, a colleague of Reddy's who also practiced in America, got involved in the case. Sreedhara did what he would have done in the United States — picked up the phone and dialed a poison-control center in Chicago. The Chicago experts gave some advice, but there was no way to reverse the overdose. It was too late. "He was just crashing," Sreedhara says. "His blood pressure was dropping. He had multisystem failure. That means his kidneys were shot. His breathing was not good. So he had to be put on a ventilator." Sreedhara says that in 99 out of 100 such situations, "We would lose such a patient." A team of specialists rushed to rescue the boy. All of them, it turns out, had practiced in America: a lung doctor and a cardiologist who both came back from New York, along with Reddy from Louisiana and Sreedhara, a kidney specialist who practiced for years in Florida. It was a veritable returnee team of docs. The group brought a spare-no-expense attitude to the case. "Because he was only 17, we were not ready to give up," Sreedhara recalls. "We knew that if we could hold him for a couple more hours or days, we could keep him alive." The ability to muster a team like that — with decades of experience in the States — was unheard of in India until recently. That kind of care is accessible now to only a minority of Indians — those who have plenty of cash, or the 10 percent or so who have health insurance. But that's a growing number. Soon India's middle class will be as large as the entire U.S. population. For-profit hospitals like Wockhardt's are springing up all over to serve these patients. And they're offering signing bonuses and stock options to attract doctors from America. Often their Web sites boast of the number of American board-certified physicians on their staffs. That has many Indian doctors in America thinking about going home. Over a cup of coffee on the Harvard Medical Area campus in Boston, 8,000 miles from Bangalore, Dr. Manas Kaushik talks about the emigration of Indian doctors. Kaushik is Indian himself. 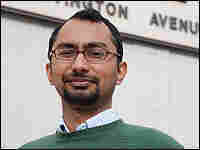 He has done research at the Harvard School of Public Health on the brain drain of doctors out of India. He tracked hundreds of graduates from the All-India Institute of Medical Sciences, India's equivalent of Harvard Medical School. He looked at alumni dating back to the 1950s. "Over this period, we roughly had 450 physicians who graduated from the All-India Institute of Medical Sciences," Kaushik says. "And almost 50 percent of them emigrated to the U.S."
In 50 years, Kaushik says, only one of those doctor-emigrants went back to India — and he returned to America a year later. No other country has exported as many physicians as India. More than 40,000 practice in the United States, making up one of every 20 U.S. doctors. But Kaushik says the tide is beginning to turn. There are no statistics, but there is a lot of anecdotal evidence that Indian doctors are buzzing about the new opportunities to practice American-style medicine in India. "I'm a recent immigrant myself, and I've talked to a lot of my friends who have made tough decisions about moving to the U.S., and some of them are thinking of going back," Kaushik says. He plans to return to India himself, with the goal of building a more equitable health system. "I see India changing all the time," he says. "It's just a very exciting time to be an Indian." Back in Bangalore, kidney specialist Rajanna Sreedhara and his wife Malathi, a pediatrician, are in the vanguard of the trend. They're in their 40s, with two daughters ages 7 and 11. As a skillet of puri sizzles in her well-equipped kitchen, Dr. Malathi Sreedhara talks about their decision to return to India. She says she works harder here — six days a week, sometimes even on Sunday. But it's worth it, she says, to raise her daughters in their native culture, and to be near family. And the Sreedharas live well, by any standard. They built a three-story house in a nice neighborhood, with 12-foot ceilings, marble floors and teak woodwork. "We have four bedrooms, a study, living room, dining room, kitchen," Rajanna Sreedhara says. "This is a moderate-sized house, I would say." But is it bigger than their Florida house, a visitor asks. "Oh, yes, definitely," the Sreedharas reply. But the couple earns much less than they did in Tampa. "I would say currently I am making probably one-tenth of what I was making in the U.S.," Rajanna Sreedhara says. "But that's what I had planned, you know. That is sufficient for us. We live very modestly, conservatively." The equivalent of $30,000 goes a long way in Bangalore. In addition to a big new house, it buys servants, private schools and nice vacations. But the biggest lure, the Sreedharas say, is simply that it's home. Even so, Rajanna Sreedhara says he might not have come back if Indian medicine hadn't changed so much, at least in the modern hospital where he works. It's as well-equipped as almost any in America. "If the medicine had not changed the way it has, I probably would have had to think again and reconsider the decision," he says. "But clearly, working in a corporate hospital here is very similar to working in America." A case in point is that 17-year-old boy who tried to kill himself after failing his exams. To save his life, Sreedhara and his fellow returnees came up with a radical solution that might only have occurred to doctors who had practiced in America. They hooked him up, right at his bedside, to a machine that took over the function of his heart and lungs. "Within minutes after starting it, his urine output was good, his blood pressure got better," Sreedhara says. "So we were able to get him through this very dangerous phase. And by about 28 hours, we took him off the machine. Without that, he wouldn't be alive." Sreedhara says that when he left India in 1987, he had never even seen a cardiopulmonary bypass machine or a ventilator. "Suddenly, whatever procedure that can be done anywhere in the world can be done in India," he marvels. "But the thing is, only in some places, not everywhere." That troubles him. As a kidney specialist, Sreedhara often sees patients who need life-saving dialysis. But fewer than 5 percent of Indians with kidney failure can get it. "They cannot afford it," Sreedhara says. "I would know they were going to die because they can't afford the treatment." That's the price of returning, he says. It's good to be home, and it's exciting to play a role in the New India. But Sreedhara knows it will be a long time before the vast majority of Indians are able to get the American-style medicine that he and his colleagues practice.